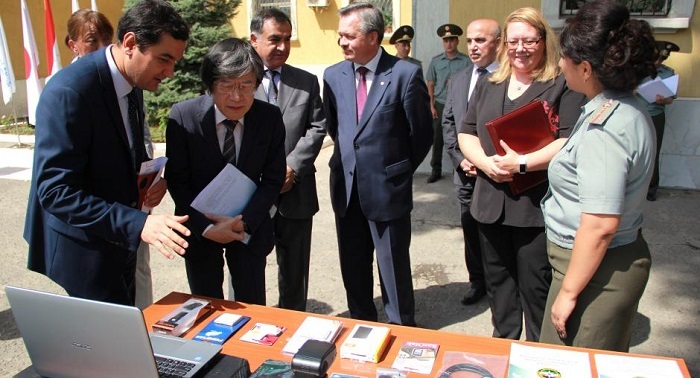 The OSCE Programme Office in Dushanbe donated technical equipment to the press centre of Tajikistan’s Committee of Emergency Situations and Civil Defence at a handover ceremony on 17 August 2018 in Dushanbe. The equipment will be used for broadcasting from locations where disasters occur, thus contributing to capacity building of journalists reporting on disasters, increasing the quality of coverage and preventing the spreading of inaccurate information. A notebook, desktop computer, digital video and photo camera, studio lighting, teleprompter and all the necessary accessories were handed over to the Committee’s press center on 17 August 2018 in Dushanbe. «With its comprehensive security approach the OSCE has an important role to play in addressing disaster risk reduction issues», said Head of the OSCE Programme Office in Dushanbe, Ambassador Tuula Yrjola, congratulating the Committee on its 24th anniversary. «We plan to follow up the equipment donation with training offered to the Committee’s press center staff so that it can effectively raise the awareness of the population on disaster risk prevention». The Chairperson of Tajikistan’s Committee of Emergency Situations and Civil Defence, Lieutenant-General Rustam Nazarzoda, thanked the OSCE for its constant support in disaster risk prevention activities and in enhancing the Committee’s press center: «We support co-operation with OSCE Program Office in Dushanbe and are grateful for the constant dialogue that promotes optimization of our interaction on disaster risk reduction issues in the future».